The bad news first: Apart from my gripes about the user interface—which are still there—there is one but. A big BUT, bigger than Ramona's, the planetary lady with accidental moustache who serves the bocadillos down at one of the fair's restaurants: The software keyboard. On this first touch, the keyboard felt cramped, probably a result of the screen size, which is smaller than the iPhone's—which is the obvious soft keyboard reference, since it was the first one to implement a finger-touch software keyboard. In addition to that, there's an additional user interface problem, this time having to do with perception: Instead of popping up above your finger—like in the iPhone so you can clearly see what you pressed—the keys appear on the sides. They flash quickly as you press them, and I found it extremely distracting. They said that they put them on the sides not to obstruct the view, but knowing the over-the-key implementation in the iPhone's software keyboard, it doesn't make much sense. Furthermore, when you are typing with one finger only—like I often do—you will be obstructing the view of the flashing key with your finger. The reason: When you type on the right side of the keyboard, the flashing keys appear on the left. When you click on the right, they pop out on the left. Other than this, the rest is great. There's a new Google Mail feature to delete or classify mail in bulk, as well as a faster camera, which now can take video—which obviously means you can play back video as well. 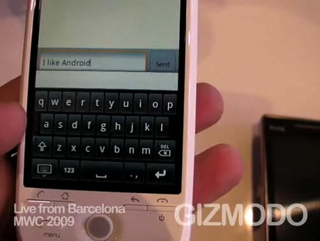 The rest of the interface and features is what you already have in the Android G1. However, what really steals the show here is the hardware itself. HTC has got a very smooth phone, which feels great on your hands and in your pants' pockets. While it's sightly thicker than the iPhone, the narrower, rounded body, and weight makes it feel the same size. For sure, a lot less bulky than the G1, which looks like a brick next to this. And as you have seen in the shots, the final HTC Magic is quite pretty. Have no doubt: This thing alone will make many consumers put up with the less-than-ideal software keyboard. Click to viewOverall, the first feeling is that we got a potential winner here. If they can manage to make the software keyboard better, Apple will definitely have a formidable enemy in the Android G2.